Beowulf, the visiting chiefs, and the young warriors of Heorot go out for a celebratory ride. Along the way tales of Beowulf’s glory are told. 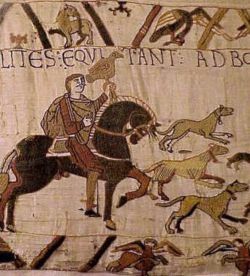 First off, in line 855, it’s really unclear if the horses that Beowulf and the gang are riding are high spirited or if the riders are. Admittedly, my Old English grammar isn’t perfect, but I think this ambiguity (mostly from word order, as far as I can tell, as little importance as that usually has in Old English) says something important about the spirit of this ride. I think the idea isn’t that either the horses or the men are in high spirits, but that both are. I think this is a bit of pathetic fallacy before Shakespeare and other giants of English literature put the device to wide use. You see, in my mind the horses are in high spirits because the defeat of Grendel has restored the natural order; there’s nothing binding the horses’ spirits, there’s no shadow of the fens holding them back. Further, as part of this restoration of the balance the connection between man and beast has been restored. There’s no more conflict between the two because Grendel the freak has been killed and is no longer able to terrorize either. Of course, this interpretation being subtextual adds a layer to it. After all, implying the restoration of what might have been understood as the natural order of things (including a belief in humanity’s having a place over animals) with the death of Grendel seems harsh. After all, not but a few lines ago the poet suggested that Grendel was a creature that may well have had a soul like a human’s and that seemed to have been empathized with by the poet. I’m no Anglo-Saxon philosophy expert, but maybe this relates to an idea of a soul being granted or manifesting at the time of death. Maybe the poet’s even getting at an idea that the soul boils down to a matter of will power. Perhaps those who die honourably within the social structure of Anglo-Saxon civilization do so knowing full well that they’ve died honourably and so they die willingly. They willingly let go of their life, of their consciousness, of their soul. On the opposite end of things, those who die dishonourably, assuming that they know that they’re dying in such circumstances and they’re aware of the consequences might struggle more against death, though their body can no longer sustain it. Then, maybe the knowingly dishonourable person’s unwillingness to die or their rejection of it forms a sort of makeshift soul. Maybe that’s all that Grendel’s was, a manifestation of the pain he endured as he struggled back to the fen. The other thing that’s important to mention in this passage comes in the last few lines. As you probably noticed, one line after the poet mentions that Beowulf is truly worthy of being king in line 861, he goes back on it faster than someone married to a jealous partner caught flirting with a super model. This is perhaps less metaphysical than the matter touched on above, but I still think it bears mentioning, since it shows the Danes’ loyalty to Hrothgar, since there’s no greater endorsement of something than turning something that seems better down, right? Though later on, we’ll have a similar pro-King Beowulf sentiment from Hrothgar himself. What do you think the nature of the soul is? Is it something you’re born with? something you earn? Or is it something that only manifests itself in the way you die? In his joyous revelry, the poet doesn’t use many compound words. And, really, even those that he does use don’t really have any weird hidden meanings. First up, on line 853, the poet gives us “eald-gesið meaning “old comrade.” Though I’ve translated it as “old war-wagers” because of the alliteration and the weirdly light lilt of a noun for combative folk fits the jaunty tone of this passage. The “old” part of this compound is definitely straightforward, since “eald” translates directly and literally to “old”. And, likewise, “sið” (the root of “gesið)” just means “comrade,” “companion,” “follower,” “retainer,” “warrior,” “count,” “thane.” So there’s no realy surprise there. This compound is just a handy combo that can be busted out for purposes of alliteration and convenience. Line 854’s “gamen-waþe” is kind of similar. Combining the word “gamen” (“sport,” “joy,” “mirth,” “pastime,” “game,” “amusement”) and the word “wað” (meaning “wandering,” “journey,” “pursuit,” “hunt,” “hunting,” “chase”), we get “merry journey.” Yes, it almost sounds like a town in Newfoundland. But there’s not a whole lot more to say here. Even though the Old English “wað” includes meanings like “pursuit,” “hunt,” “hunting,” “chase,” and the Modern English “merry journey” doesn’t really get that part of the word’s meaning across, I think it still works. Why? Well, maybe it’s a bit of a romantic notion on my part, but I really think that part of any merry journey in Anglo-Saxon England would be a casual hunt. After all, if you were a noble out joy riding on your estate and you happened across a boar or a stag – even a rabbit – I’m sure you’d probably chalk the encounter up to your continuing good fortune and then put arrow to bow and take aim. It’s almost as if a “gamen-waþe” encompassed hunting as well as just riding in high spirits, while Modern English has separated the two concepts out into separate words. Then we get to “eormen-grund” (l.859). Like the other two compound words for this entry, there’s nothing really all that weird here. Sure, you could try to bring “abyss” or “hell” into your interpretation, but I can’t see that getting too far. Though I like the sound of “between hell and here,” which, loosely, might work in a really liberal translation. But I stand by my own “face of the earth” because of the wideness implied in “eormen” since thinking about ears of corn or waves immediately puts images of expanses of corn swaying in a breeze or waters from horizon to horizon chopped with waves. Honestly, the weird thing here is that “eormen” seems to be a conjugation of the word “ēar” which is a name of the rune for “ea.” It seems that none of the Old English words derived from rune names are very clear, which, in my mind (well, maybe more so my imagination) makes it seem like a mysterious word that has secrets even Clark Hall and Meritt haven’t dreamed of. What do you think of Old English compound words? Are they a thing because the Anglo-Saxons liked the convenience of combining words to come up with new ones with varied meanings, or are they just useful for poets trying to alliterate? In the next entry, one of the riders begins to tell a tale of yore. Grendel has been defeated and Beowulf (as well as the Danes) get ready to celebrate. Getting back to the Danes’ wishes, in this entry’s passage we see that Beowulf’s wishes are also fulfilled in his deed. After all, in Anglo-Saxon culture it was one thing to boast and completely another to make good on a boast. Doing the former without the latter cost people dearly. Obviously Beowulf’s made good on his boast. So now, like a self-publishing author whose audience draws big publishers’ attention, he’s got a sure fire reputation. And, actually, that’s pretty much it for this passage. Really. Beowulf wins, he gets what he wanted (well-earned fame) and the Danes get what they wanted (a Grendel-free Heorot). Except something curious is happening around the passage’s third line (line 827). On this line we finally get a bit of what’s going on inside Beowulf’s head. We’re told that he was “gladdened by his night work/fodder for the flame of fame for courage.” (“nihtweorce gefeh” (ll.827-828)). But that’s it. The rest of the passage states that Beowulf rid the Danes of their sadness, describes the Danes’ reactions, and then explains how Beowulf hung Grendel’s arm under the roof of Heorot for all to see. 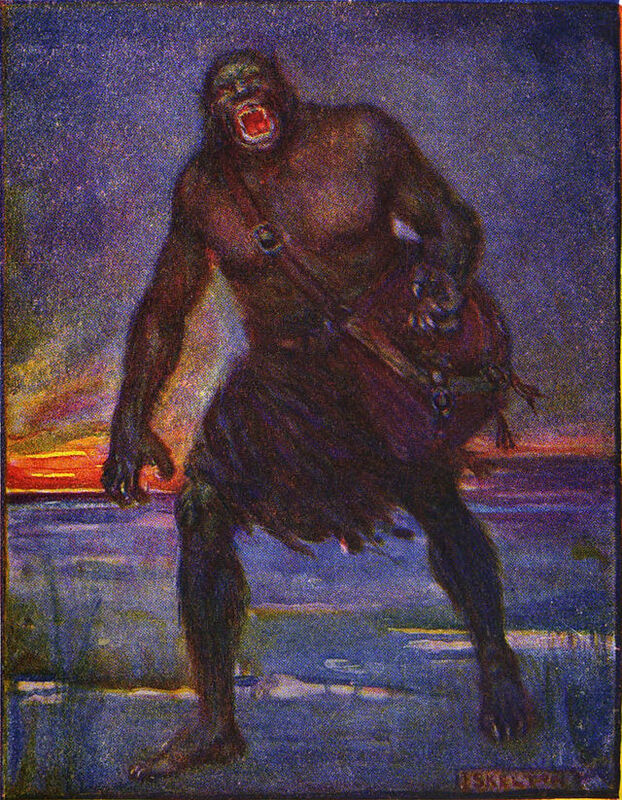 Contrasted with Grendel, Beowulf has very little of his mind and motivation examined; it’s almost as though Beowulf’s such a stock hero that the poet doesn’t see the need to elaborate on him or to flesh him out at all. Beowulf’s gladdened and that’s it. Perhaps this can be chalked up to some sort of stoic element in what the ideal Anglo-Saxon man was. Maybe emotions were to be kept to a minimum and thoughts were to be minimized over deeds. That certainly makes Grendel all the more wretched for all of his fear and his long thinking about his final moments. What’s weirder, though, is that Beowulf isn’t even mentioned by name in this passage. It might kind of odd if the poet just slammed down a line like “Then Beowulf was gladdened by/his victory over Grendel, kin of Cain,” but not once do we get his name in this celebratory section. But the absence of his name is conspicuous. In Beowulf’s case, his name might be omitted because the poet is trying to emphasize that Beowulf has specific desirable traits by establishing three attributes. In line 825 the poet calls Beowulf “that one from afar” (“se þe ær feorran com”) This epithet builds the mystery around Beowulf by moving his origin to some far away place. In doing so, the poet gives him the power of being an outsider, a risky power that Beowulf managed quite well since people hearing the full story would also hear of how he got Hrothgar to trust him enough to legally grant him Heorot for the night. Then, in lines 828-829, Beowulf’s ancestry is roughly given (“that man of Geatish/folk” (“Geatmecga leod”)), establishing Beowulf as a member of a group and removing any possible mislabelling of him as some sort of exile. Most important of these attributes, perhaps is that Beowulf is identified as the “war-fierce one” (“hildedeor” (l.834)). Though along with being important, its placement as the final of these epithets for our hero is just as important. Assured of Beowulf’s identity, the poem’s audience is then free to feel secure in his war fierceness. He’s not some kin-less mercenary who’s fighting for the wrong reasons, nor is he an established enemy of the Danes. Plus, being war-fierce was pretty much the only thing on Beowulf’s CV when he first appeared among the Danes. Repeating this attribute here cements that part of his reputation. Thus, I think the poet’s dropping “Beowulf” from the text here is his way of establishing what makes Beowulf a stable hero (and maybe gives audiences some epithets for the Geat). Also, in keeping with the importance of tying boasts to deeds, it’s interesting to note that all of these attributes are tied to actions (more or less): Beowulf is “that one from afar,” implying that he’s hearty and savvy enough to travel long distances; he is “of the Geatish folk,” establishing that he’s a representative member of a whole people (and implying that the Geats themselves have enough faith in him to let him go and be such a representative); and he is “war-fierce,” an adjective that is entirely active. What do you make of the poet’s leaving Beowulf’s name out of this passage? Is he trying to bring more variety to his alliterations? Working to show Beowulf’s reputation growing? Or something else entirely? To try to keep this section from running too long, I’ve chosen three compound words to wonder about in this entry. First up is line 827’s “niht-weorc.” This word, as it looks and sounds, just means “night work,” as in work done at night. Maybe, if you stretch it, the word could also be used to describe the amount of work that can be done in a night. So. Why am I picking on this word when there are other compounds in this entry’s passage? Well, because according to Clark Hall and Meritt’s dictionary “niht-weorc,” a compound that seems like it should have pretty wide applications, appears only in Beowulf. If you look at the line on which it appears, it seems like the poet may have made it up for the occasion, since it mirrors the first half of the line’s “wið niðe” as far as initial consonants go, making for a sort of reflective alliteration. But, even so, why doesn’t “niht-weorc” show up elsewhere? I mean, surely people picked up on this word, saw its practical application and used it to describe things fairly frequently. Perhaps this one word is definitive evidence for Beowulf‘s being written down (or at all) at some point in the eleventh century, making it too late for such a word to really get into everyday use since the conquering Norman’s Old French terms were already coming into vogue. This entry’s second word is “ellen-maerðu”. Again, this word’s fairly straightforward since ellen means “zeal,” “strength,” “courage” “strife,” or “contention,” and “maerðu” means “glory,” “fame,” or “famous exploit.” So the word’s general meaning is just a reversal of the Old English words’ order, really. What makes this word noteworthy, though is that it’s the only word in its half line, which is why I embellished my translation of it so much. After all, I feel like an appropriate image for being famed for anything is a fire since it gives off a great light and some smoke, both of which draw people’s attention. But fame is also something that needs to be tended to, lest it go out. Third is another somewhat lacklustre compound. This word is the combination “inwit-sorge” meaning “sorrow.” But that translation misses the mark. How much alteration do you think is necessary when it comes to translating things like compound words from one language to another? Are literal translations better than figurative ones? Or vice versa? In the next entry the Danes party as people come from afar to see Grendel’s arm and the beast itself meets his end. Grendel realizes he’s done for and the Danes have their hearts’ desire fulfilled. This part of the poem continues the poet’s peering into Grendel’s psyche as he gets trounced. The first two lines might give us a little more insight into just why he’s bothering to do so, too. These lines clearly state that “Beowulf was given/war glory” (“Beowulfe wearð/guðhreð gyfeþe” (ll.818-819)) while Grendel definitely was not. I think this contrast of outcomes tells us exactly why the poet gives so much attention to Grendel: he’s the underdog, the loser in a history written by the winners. In this sense, I think that Grendel could be a stand-in for the Celts that the Anglo-Saxons assimilated into their own culture. In that reading, the violence of this fight represents the Anglo-Saxons forcing those early Britons off of their land and from their seats of power. But within the realm of the poem, I think saying that Beowulf won glory and Grendel suffered a terrible wound leads the poet to talk more about Grendel than Beowulf simply because his audience was probably deeply familiar with war glory. They didn’t need any more droning on about it. And yet stories of defeat were also popular, as the Finnsburgh Fragment and the story of the Geats in the Ravenswood show. I think sharing Grendel’s side of the story is meant to tap into the same interest in defeat that these other stories exploit. This angle definitely accounts for the poet’s spending so much time on Grendel’s reactions. Even the poet’s description of Grendel’s having to flee to a “joyless home” (“wynleas wic” (l.821)) supports the reading of the focus on Grendel being instructive or at least interesting to the Anglo-Saxons. After all, the idea of a joyless home sounds very similar to that of an exile’s home. Home (or a “dwelling place,” “town,” or “fortress,” as “wic” can alternately be translated) has connotations of being a place where a person can exist in comfort. What’s a place where you have to exist but with out that comfort, without that joy? It sounds like exile, to me. Plus, I think the reference to Grendel’s days being numbered works as a kind of exaggerated reaction to the exile that he’s suffering. Being forced not from the core of society, but rather from the margins of it – from life itself – has Grendel in a state of utter misery. The other curious thing in this passage (and not to horn in on the subject matter of section two) is the phrase “wiste þe geornor” (l.821). Literally, this word means “knew he eagerly” but it’s generally translated as “knew for certain.” Working backwards from the general translation to the literal meaning of the phrase, I see an implication that eagerness can be construed as certainty in the original Old English. And this connection does make some kind of sense. When someone says that they know something for certain or for sure, their knowledge of it could still be wrong because they’re referring to an external piece of information. For example, if I say that I am totally certain that the corvette on the corner is red I could still be wrong because it could actually be mauve (perhaps a small detail, but still an alteration of a “real” fact). Thus, line 821’s “wiste þe geornor” introduces a curious sort of philosophical bent into the Anglo-Saxon language. Eagerness and certainty seem to cross over here, and since eagerness is in the mix, maybe bravery can be too (you could say being brave is being eager to do right despite opposition). Really, they’re all just forms of eagerness, if you think about it as Anglo-Saxons (or at least those translating them) did. How much do you think can be learned about a society or a people from their language once that language is considered dead? For a short passage, this week’s is pretty rich in compound words. Though they’re all deceptively straightforward. In fact, “guð-hreð” leads the pack in being straightforward since as a compound it means “war glory” while its parts mean “war,” “combat,” and “battle” and “victory,” and “glory” respectively. Hence “war glory” (or the alternative, more staccato, “battle victory”). Next up in terms of straightforwardness is “wael-raes.” This one combines “wael (“slaughter” or “carnage”) with “raes” (“rush,” “leap,” “jump,” or “running”) and gives us “deadly onslaught.” Though, with that combination of words something more literal would be “slaughter rush,” which sounds like it’d be right at home describing a game mode in a modern day FPS (or beat ’em up game). Then there’s the most obvious “fenn-hleoðu” meaning ” fen covert.” I consider this combination of “fenn” (“mud,” “mire,” “dirt,” “fen,” “marsh,” “moor,” or “the fen country”) and “hleoðu” (cliff, precipice, hill-side, hill) to be fairly straightforward because of its reference to a rise of earth in a wild countryside. In my mind, this combination readily brings to mind a rough shelter in the midst of difficult or untamed terrain. This is especially true if you take “hleoðu” to mean “cliffside” or “precipice” since that leads me to visualize some patch of land below such an outcropping, which would be sheltered from the elements in a natural way, though, probably to a civilized bunch like the Anglo-Saxons, it might seem very crude. Actually, curiously, if you take this combination completely literally to mean a hillside in a fen, then you come out with a phrase describing a hillside dwelling that might be closer to a hobbit hole than we realize. Tolkien did start with extensive study of Beowulf, after all. The combination of the two words “feorh” (“life,” “principle of life,” “soul,” “spirit”) and “seoc” (“sick,” “ill,” “diseased,” “feeble,” “weak,” “wounded,” “morally sick,” “corrupt,” “sad,” or “troubled”) isn’t so obtuse as to obscure its meaning completely, but with this compound we’re definitely getting a look at the Anglo-Saxons’ conception of things. After all, among seoc’s meanings is “wounded,” but also a general sense of being sick, which, even then probably wasn’t considered to be as dire as having a hole opened up in your body. When it comes to translating compound words, do you think it’s more accurate to go with a straightforward interpretation or is it better to go with something that takes both parts of the compound into consideration? Next week, the poet comes around to Beowulf’s point of view as he describes the hero’s reaction to his victory and the placement of his gory trophy.